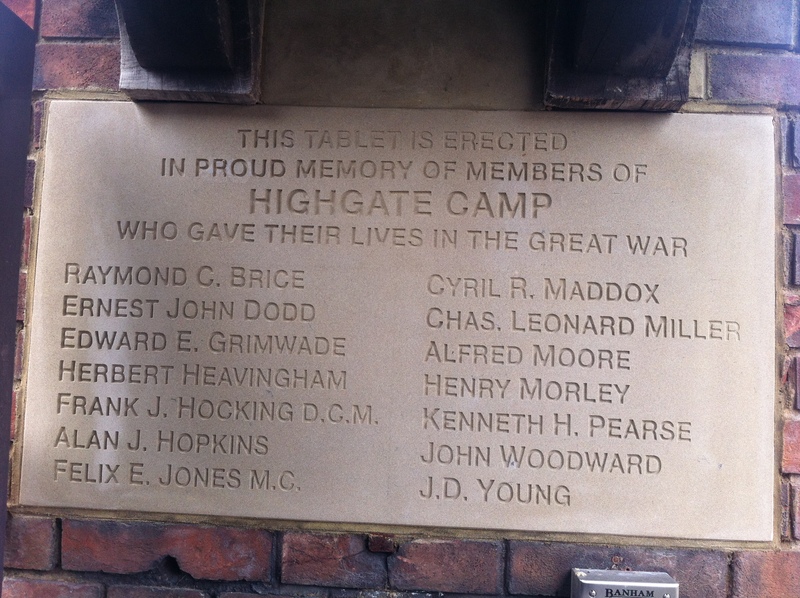 Hidden away in a gateway in London’s Highgate Village are two restored First World War memorials. Private Herbert Heavingham (21) of the London Rifle Brigade, who was killed on 27 April 1915 and whose name also appears on the Menin Gate at Ypres. Lance-sergeant Frank Hocking DCM (21) of 7th Battalion, the Middlesex Regiment who died on 14 May 1915 and is buried in Highgate Cemetery. Lieutenant Edward Grimwade (31) of 9th Battalion, Lancashire Fusiliers, who was killed on 17 September 1916 and whose name also appears on the Thiepval Memorial to the Missing. Lieutenant Felix Ernest Jones MC of 4th Battalion, Oxfordshire and Buckinghamshire Light Infantry, killed on 16 August 1917 and commemorated on the Tyne Cot Memorial. Sergeant Raymond Brice of 9th Battalion, Royal Sussex Regiment, killed on 14 February 1916 and buried at the Menin Road South Military Cemetery. Second lieutenant Kenneth Pearse (23) of 11th Battalion att. 2nd Battalion, Hampshire Regiment, killed on 6 August 1915 at Gallipoli and commemorated on the Helles Memorial. He lived at Brentor, Grange Rd, Highgate. The opposite panel is dedicated to lieutenant-commander J Dawbarn Young (40) of the RNVR, ‘who fell at Zeebrugge’ on 23 April 1918 and is buried at Saunderton in Buckinghamshire. He was a graduate of London University and a surveyor by profession, whose parents were living at a house on North Hill, Highgate, in 1901. 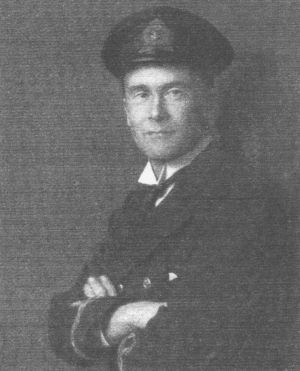 An excerpt from the Ostend and Zeebrugge Dispatch, by Sir Roger Keyes states: ‘Lieutenant Commander Dawbarn Young, RNVR, was in command of ML110. He had volunteered to precede the block-ships and light the entrance of the harbor and canal with calcium buoys. Whist approaching the entrance ML110 was struck by three shells, which killed and wounded half the crew and wrecked the engines. 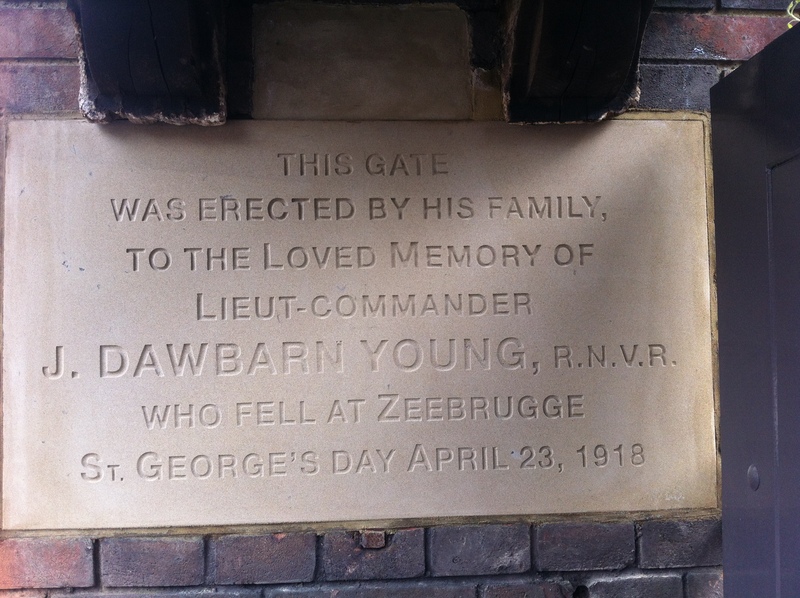 This entry was posted in Events and tagged 1918, Centenary of the First World War, Highgate, Highgate Camp, lieutenant-commander J Dawbarn Young, London, memorials, news, UK News, Zeebrugge Raid. Bookmark the permalink.